Luxardo is a family-owned company founded in Zara, a port city on the Dalmatian coast of what is now Croatia. Girolamo Luxardo, a Genovese businessman, and his wife, Maria Canevari, moved to Zara in 1817. It was Maria who began perfecting “rosolio maraschino,” a liqueur produced in Dalmatian convents since medieval times from special maraschino cherries. In 1913, Michelangelo Luxardo built the most modern and massive distillery in the Austro-Hungarian Empire, but it was destroyed in World War II by Anglo-American bombings. Only one member of the fourth generation, Giorgio Luxardo, survived the World War II invasion and fled to Italy. Escaping with only a cherry sapling, Giorgio crossed the Adriatic Sea to the Veneto region of northeast Italy and reconnected with a colleague who had saved the Luxardo recipe book. Armed with the surviving tools and a desire to reestablish his family’s legacy, Giorgio chose the small Veneto city of Torreglia to rebuild the distillery in 1946. At this new home, Luxardo restored its extensive product line of Italian liqueurs and continued to export the products to markets around the world. Luxardo continues to produce Maraschino to Maria Canevari’s original recipe, as it was written down in 1821. Today, Luxardo is operated by Franco Luxardo of the family’s fifth generation, along with members of the sixth. 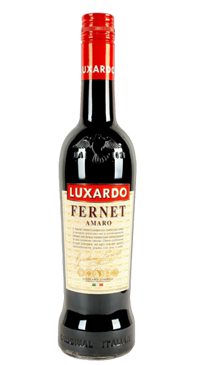 Fernet is an a classic ltalian bitter. This digestive is obtained from the prolonged infusion of herbs and spices such as liquorice, condurango, cinnamon, enzian, saffron and cinchona. 40% alc vol.